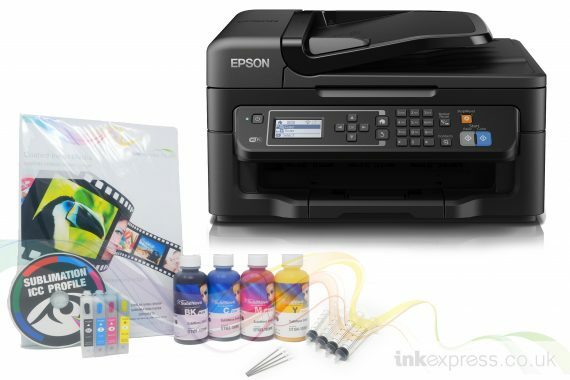 This package includes the Epson Workforce WF-2630WF inkjet printer, empty refillable ink cartridge set, plus syringes and needles for easy refilling. The Epson Workforce WF-2630WF is one of our most popular printer packages and works fantastically well with our refillable ink cartridges. The Workforce WF-2630WF is a multi-function printer (with scanner and copier) ideal for producing sublimation transfer prints. The refillable ink cartridges are supplied empty so can be filled with any ink that the buyer chooses, a popular choice for these printers is dye sublimation inks for heat transfer printing. 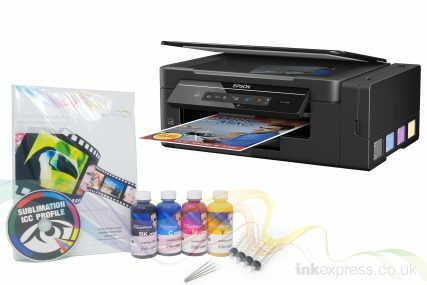 The printer is a brand-new unit and is supplied in its original retail box complete with drivers, software and power lead. Empty refillable ink cartridge set designed to replace the Epson T1631- T1634 (T16 series) ink cartridges. These cartridges are supplied empty without ink so they can be filled with an ink of your choosing. The cartridges feature a sponge-less hollow design so they can be refilled again and again. They have the latest micro chip set this will reset when the ink cartridge is removed to be refilled with ink. The cartridges are made from opaque plastic so it is easy to see how much is required to refill them, they also have rubber refill seals for easy and quick sealing after refilling. These inks have the ability to be used for heat transfer printing on transfer paper. For smooth ink flow without head clogging, we make particle size of dispersive dyes smaller under 100nm (0.1um) and use the high-class dyes to keep their colour shade in harsh conditions. The Inktec Sublinova Dye sublimation inks have superior printing quality under various printing environments. Achieve true black transfers with Inktec Sublinova inks, perfect black sublimation; not brown like some of the cheaper inks on the market. Our Premium Quality Sublimation Paper is specially formulated to give excellent results when used on all solid substrates such as ceramics, woods, glass, metals, polymers, etc and also on all light coloured, sublimation ready fabrics. Being a light weight paper, it is ideal for mug printing as it will easily wrap around the object without creasing to folding. The paper is designed to hold the printed sublimation ink on the surface of the paper to ensure good transfer when the ink is heat pressed on the product, as the ink has not soaked into the paper it will transfer more ink relieving a vibrant and bright transferred image. We provide a custom ICC profile that has been made specifically for this printer package. It has been created for the Inktec Sublinova ink set, our Sublimation paper and the ET2600 printer. We provide the profile on a disc and include setup instructions for Adobe Photoshop. Although the use of the ICC profile is not essential, it is ideal if you are trying to get very close spot colours to match company logos or particular colour shades. The ICC profile must be used with photo editing software capable of handling colour management. We use Adobe Photoshop, but Abode Elements and Coral Draw are popular software choices.